Within a year or so, the original black color begins to pale. The binder asphalt begins to lose plasticity. Hairline cracks form. After five years the entire thickness has oxidized and become brittle. The color is light gray. By the eighth year, cracks extend clear through the pavement. Material is loose on the top. The base fails as water soaks through. Within a year or so, areas with alligatoring cracks become potholes. After fifteen years, the entire surface will have broken up. When was the last time that you thought about your asphalt parking lot and its upkeep? This is the same place where you park your car everyday and the entrance to your home or office. It is a known fact that first impressions are lasting and this is true for your clients or friends when they drive into your parking lot. They are either encouraged to come and visit you or turn around and drive away, depending on the look of your surroundings and yes, this includes your parking lot! We will first start with a few statistics of asphalt parking lot upkeep. If your asphalt is sealcoated every three years, it will have an average life span of thirty years. If your asphalt is not sealcoated, it will have an average life span of fifteen years. Asphalt repairs can cost as much as much as $6.00 per square foot. Sealcoat can be applied for as little as 8 cents per square foot. It doesn’t take a genius to figure out that sealcoating your asphalt every three years prevents major repair costs in future years. 1. Rough Asphalt – Is the surface of your asphalt not smooth? Can you see the tops of the rock or aggregate showing through? Are pieces of rock coming out of your asphalt? These are all signs that you need to have your parking lot sealed and repaired. Excessively rough areas usually require installing a new asphalt skin patch prior to sealcoating so that the sealcoat will last when being applied to these areas. 2. Cracked Asphalt – Do you have cracks appearing in your asphalt? These can be caused by either excess water under the parking area or lack of proper sealcoat maintenance over the years. These areas can be repaired by either rubber crack filling or removing and replacing them with new asphalt depending on how severe the damage has been. Cracks can also be caused by tree root pressure. 3. Worn Stripes – Is your parking space striping and stenciling looking worn? Are the old lines appearing through your old sealcoat? These are signs that it is time to sealcoat and re-stripe the parking area. Striping is the most noticeable part of the parking lot and it is very important that you have a neatly done job. When choosing an asphalt contractor to do the work, make sure you ask for references to previous jobs that were completed. Call those people to see if they were satisfied with the asphalt contractor’s work. Remember, price is not everything! Some contractors use better materials and do better work than other contractors. As a rule of thumb, make sure that the asphalt contractor dilutes the sealcoat he uses with a maximum of ten percent water. This way you will get a thicker coat of sealer that will last a long time. When your asphalt is severely cracked (alligatored) and needs to be removed and replaced with new asphalt, make sure that the new asphalt is installed to a depth of at least three inches. This will usually give you a good solid patch.Remember, first impressions are lasting. People like a clean well kept parking lot. Good Luck! STOP…AND THINK ABOUT YOUR ASPHALT DRIVEWAY! When was the last time that you thought about your asphalt driveway (the path that leads to your humble home and the place where you park your car)? This article will give you the in’s and out’s on caring for your asphalt driveway, whether it is new or otherwise. If you have an asphalt driveway, seal it! The sun and water are your driveway’s worst enemies. If you do not regularly seal your driveway, the surface will become rough and the asphalt will start to crack, causing further damage. If your driveway is older, has started to get rough, and is forming small cracks it is even more urgent that you seal it to protect your investment. If you decide to do the job yourself, you can buy asphalt sealer in five-gallon containers at any of your local lumber companies or home improvement stores. You also need to purchase a special sealer broom to apply the sealer and a paintbrush to cut in along walls and tight areas. Applying the sealer to your driveway can be tricky. You need to apply it in even brush strokes. When it dries it will look just the way you brushed it on. The sealer will dry very fast so you need to work very quickly. There is a big difference between the sealers that you can buy and the sealers that are used by asphalt contractors who seal driveways for a living. The sealers that the asphalt contractors use contain silica sand and/or slate which allows the seal to last about twice as long as the kind purchased at the store. The asphalt contractor uses a mixer machine to keep the aggregates agitated. Otherwise, it would stick like lead to the bottom of the container. If you seal your own driveway, it’s good to do it about every year. If you have a contractor do it, have him seal it every three years. Your driveway is an investment. The better you take care of it, the less it will cost you in the long run. The best thing about a well-maintained driveway is that it looks great and enhances the look of your home. DOES YOUR PARKING LOT SING THE TRASH TRUCK BLUES? can’t count the amount of phone calls that we have received from irate apartment owners. The conversation usually starts out by the owner saying, “Those darn trash trucks are ruining my asphalt parking lot. There are cracks as far as the eye can see and the ground is starting to heave. I’m afraid that one of my tenants is going to fall and brake a leg.” As you know, these are all very valid concerns. Trash trucks are the leading cause of asphalt parking lot damage. Generally, parking lots are not constructed to handle heavy truck traffic. Usually the base material (decomposed granite) on older parking lots has not been installed or has been installed in a very thin layer. The pavement that is laid on top of this base is only as strong as the base material. This can cause premature stress on the asphalt pavement when a heavy truck passes over the surface. Think about it! One pass of an 18,000 pound load on a single axle truck has the same effect on an asphalt parking lot as 9,600 automobile passes. What does your local trash truck weigh when it is full of wet, smelly, compacted garbage? It usually weighs more than 18,000 pounds. If your trash truck shows up once or twice a week, the damage load can be the equivalent of between 10,000 and 20,000 cars. That’s a lot of traffic! By now, you are probably wondering what you can do about this problem. Depending on your property, there are several measures that you can take to help repair the current damage and limit future trash truck damage. The first thing that you should do is to repair the damage that the trash truck has caused. This usually requires saw-cutting and removing the damaged asphalt and replacing it with new asphalt to a depth of not less than four inches. The new asphalt patch should always be deeper than your existing asphalt. If your trash truck damage is not too severe, you can have your damaged areas overlaid with a new layer of Petromat and asphalt. This is less expensive than removing and replacing your asphalt. Petromat is made out of fiberglass and is designed to help prevent your old pavement cracks from coming through the new layer of asphalt. 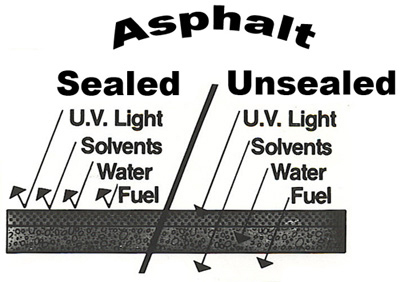 The new layer of asphalt must be a minimum of 1.5 inches deep over the Petromat for maximum effectiveness. Since the level of your existing parking lot will be raised by Petromat patches, you have to make sure that water puddling will not become a problem. After your asphalt patches have been completed, you should sealcoat and re-stripe your parking lot to keep it looking nice and to help keep your patches tightly locked and waterproof. The second thing that you should do is to figure out how to help prevent the damage from occurring again! One way to do this is to install concrete pads where the trash trucks cause the most damage. Usually this is in the FRONT of your trash dumpsters. The concrete pads I see are usually too small or are in the wrong location. You need to make sure that the concrete pad is longer than the trash truck and is installed where he stops and picks up your trash dumpster. The reason that this area is subject to the most damage is that the trash truck is stopped causing the most down pressure on your pavement. The truck also shakes and shudders when it is dumping your dumpster which causes additional stress on the area. The concrete pad should be a minimum of six inches deep, using steel rebar and 3,000 PSI concrete. The third thing that you should do is to review the existing locations of your trash dumpsters. Closer is better! Some apartment properties are situated so that the dumpster areas can be moved closer to the street. Just remember, the closer to the street that you can locate your trash dumpsters, the less it will cost you in parking lot repairs. In most apartment owner cases, this means thousands of dollars $$$ in long term savings.